No doubt, Facebook is number one social media website. Not because it is ranked after google. But it has user friendly environment and provide number of functionality. It help us to connect with our friends, family and following. Moreover it is great platform to connect with new customers. It give us unique identity over internet and many people are using it to build better online business and company. When it comes to connect with other people, we've only two options. Either we can follow them or we can send them friend request. Following someone is not a good idea. Why? Because follow means you're giving your reputation to the person you're following and he will not be able to get your updates in his news feed. Am I right? Let me correct if you think I am wrong. Now we are left we 2nd option only which is by sending requests to other people. It's been said that a normal person can have only 200-250 friends ( those who are real ). But to get better fame and stardom ( indirectly more likes ), one have to add more friends as much as possible. Facebook limit this to 5000 only and its a quite big value. Now the question is - Did sending friend requests to unknown people can help us get more likes? The answer is YES. But not all the time, as there is big risk to try this on your real account. Their may be chance that you'll be Banned by Facebook ( It's getting smarter day by day ). Somehow if you've done this mistake earlier, you can rectify it. This is what I am going to teach you here. 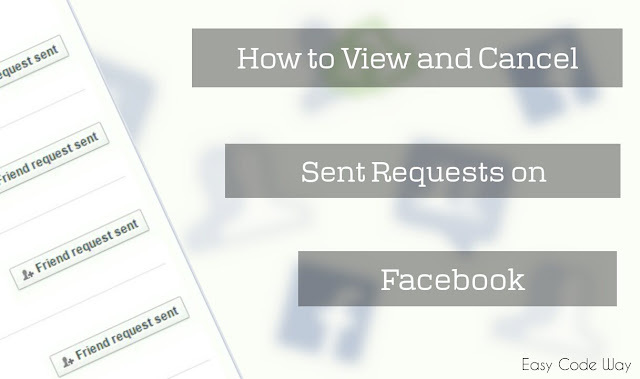 Today we will discuss on how to find or check sent request on Facebook and side by side we will remove them all. In next part of the tutorial, I had written some of the most hilarious reasons why you should immediately remove sent requests. So lets begin now! 1. Login to your account and move to Home page. 2. From top navigation menu, click on "Find Friend" Icon as shown in below picture. 3. A drop-down list will appear where you'll find "View all" Button at the bottom. Just click it. 4. Now a new window will open. Click on " View sent requests" option as shown in below picture. 5. Here you will find a complete list of all friend requests you had sent in past. 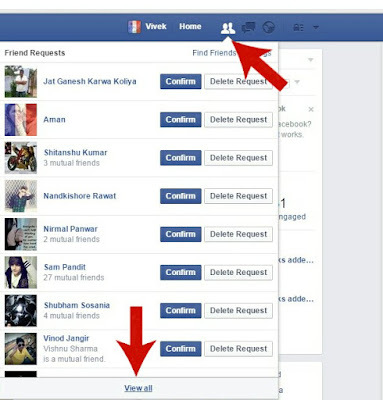 Just hover to "friend request sent" button next to the person name and a small drop-down menu will appear. 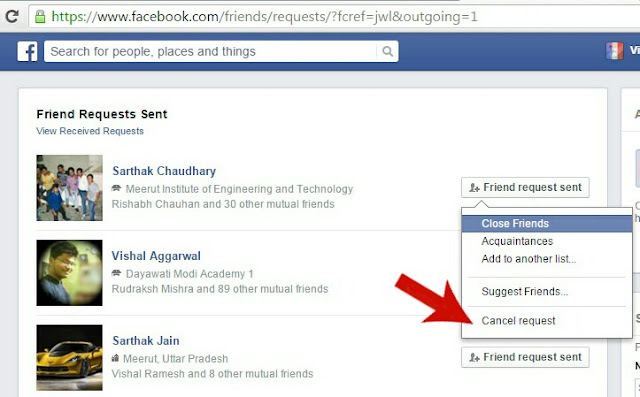 select "cancel request" option from here ( See Below Picture for Help ). 6. Now a pop-up box will appear for confirmation. Press enter or continue. Repeat these steps for all people and that's it. Why you should Immediately Cancel all Sent Requests? If you're reading this post randomly, you may wonder about why we need to delete sent requests. So to answer this question, below I had listed 2 reasons for you. Most of the people have enabled follow option on their account. This not only help other people follow them directly but it can also convert friend requests into followers if a person doesn't accept them. Think it in this way - If you send me friend request and I don't accept it then too you're following me. As I already mentioned, follow is just like losing your reputation for no reason. So why to follow someone who doesn't care to add you as a friend. This case is opposite when you're following some celebrities. Facebook security system is getting smarter and tight day by day. Sending friend requests to unknown people is a part of spam and it is against Facebook policies. So did you think that Facebook like company will allow you to do so. Definitely NOT and this is the main reason why I mentioned that you may be blocked in coming day. So Its better to clean your account before Facebook will penalize you. I had covered almost all points on this topic and hope that you get them all. Finally If I had missed something, please let me remind in comment box. What other helpful reasons did you find? Start discussion below.